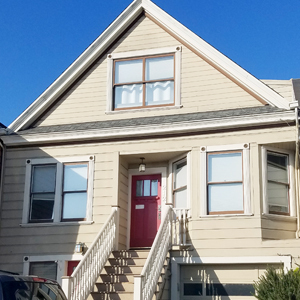 SAN FRANCISCO (May 16, 2018) — City Attorney Dennis Herrera announced today he has sued the property owners who unlawfully converted a single-family house in Bernal Heights into a two-unit building and used it as an illegal hotel, renting it out through online short-term rental sites Airbnb and HomeAway/VRBO. During one of those short-term rentals in October 2017, guests hosted a wild party where fights among partiers devolved into a massive shootout. The gunfire sent dozens of partygoers fleeing through the neighborhood, running from rooftop to rooftop and trespassing through residents’ backyards. Police recovered more than 100 bullets and shell casings from the gunfight. Bullets pierced neighbors’ homes, damaging windows, doors and, in one house, the living room. Eighteen parked cars were damaged by gunfire. Miraculously, only one person was shot that night. The wound was not fatal. Approximately 10 weeks later, on Jan. 28, 2018, a neighbor found a discarded firearm in his rarely used backyard and accidentally discharged it, injuring his hand. A City Attorney’s Office investigation found that between June 2016 and October 2017, the owners had unlawfully rented out 212 Banks St. as a short-term rental for at least 319 nights, charging nightly rates sometimes topping $800, while they lived in Bali, Indonesia. Herrera filed a lawsuit May 10, 2018 in San Francisco Superior Court against the owners — Erik M. Rogers and his wife, Anshu Singh — seeking a court order requiring the property to be brought into compliance with the law and imposing stiff restrictions to ensure it’s not used as an illegal hotel. The lawsuit also seeks hundreds of thousands of dollars in monetary penalties to deter future violations. According to the civil complaint, the couple violated state and local laws by renting out the property for tourist rentals, including engaging in unlawful business practices, creating a public nuisance and violating San Francisco’s short-term rental law. The couple also violated a host of building and planning codes by illegally converting the house from residential use to tourist use and chopping it into two units without permits, according to the lawsuit. Herrera praised the Office of Short-Term Rentals for its assistance in bringing this case and others like it. San Francisco requires, among other things, that anyone renting a housing unit for less than 30 days at a time register with the City’s Office of Short-Term Rentals and be a permanent resident of that unit — residing at least 275 nights per year in the unit. Even if you own or rent a multi-unit building, you may only rent out one unit for short-term rentals, and it must be the unit in which you live. Units cannot be rented out as short-term rentals for more than 90 days per calendar year. The rules are designed to prevent residential housing from being turned into de facto hotels, rather than used as long-term rentals for residents. Rogers and Singh purchased 212 Banks St. on Oct. 22, 2010. Rogers and Singh have not used the property as their primary residence since at least 2013, and instead spend most of their time in Bali, Indonesia. The couple used Airbnb and HomeAway/VRBO to rent the property for unlawful tourists stays from at least June 2016 through the end of October 2017. Roger and Singh maintained separate listings for the upstairs lawful dwelling unit and the main-floor illegal in-law unit, and would rent either or both units to tourists. Because the defendants are often in Bali, they hired and used other people to manage their unlawful rentals. The Office of Short-Term Rentals denied Rogers application the next month after determining the property was not his primary residence, that he had failed to submit the required business registration certificate and that the property contained an illegal kitchen and dwelling room. Undeterred, Rogers and Singh continued to rent the property to tourists in violation of the law for 11 more months. The lawsuit seeks an injunction requiring the defendants to bring the property up to code, prevent them from using it for short-term rentals, and other steps to ensure the property complies with the law. The City is also seeking civil penalties of up to $2,500 for each act of unfair and unlawful business competition; up to $1,000 per day for illegally converting the property to tourist use; and between $200 and $500 per day for each violation of the city’s planning, building, plumbing and electrical codes. The case is: City and County of San Francisco and People of the State of California v. Erik M. Rogers et al., San Francisco Superior Court No. CGC-18-566441, filed May 10, 2018. More information can be found on the City Attorney’s website: sfcityattorney.org.